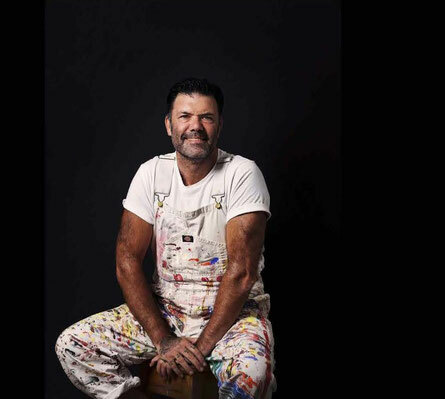 Born Adam Douglas Hill Blacktown (1970), Western Sydney to an Aboriginal Father and an Australian Mother. Originally trained in illustration and photography, observing a family of artisans, became self-practiced in painting with a style influenced by the study of Graphic Design and devoutly politicised per social justice. His works have been collected by AAMU (Utrecht), National Gallery of Australia, National Maritime Museum, Town Hall Collection, Taipei Museum and Regional Councils. Blak Douglas is a classically trained Yidaki (Didgeridoo) player. His performances include the Festival of Dreaming, Matthew Doyle Dancers, the Australian Idol final, The Deadlys, Rugby World Cup opening ceremony, 'Requiem' Peter Sculthorpe and International and national tours (Musica Viva) and Paul Jarman Projects.